Rainwater is usually collected from roof surfaces and directed to downspouts with filters that treat water as it moves to the rainwater collection tank. Many tanks also have internal mechanisms that further ensure the cleanliness and safety of the rainwater collected. 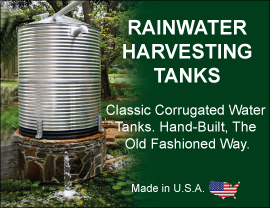 Rainwater collection can be used for cleaning, watering landscapes, flushing toilets, and other indoor and outdoor non-potable purposes. With an appropriately equipped and maintained rainwater collection system, families can save money and help to sustain water supplies. By tapping rain water collection systems year around – not just in drought conditions – more water remains in reservoirs. For rural households that depend upon private wells for water, a rainwater collection system is a great safety net. Call toll free today: 1-877-655-1100 to speak to one of our friendly and knowledgeable Rainwater Collection Specialists.